Abha (Arabic: أَبْـهَـا‎, ʾAbhā) is the capital of 'Asir Region in Saudi Arabia. It is situated 2,270 metres (7,450 feet) above sea level in the fertile 'Asir Mountains of south-western Saudi Arabia, near Asir National Park. Abha's mild climate makes it a popular tourist destination for Saudis. Abha was the capital city for the Prince of Asir Ibn Ayde under the authority of the Ottoman Empire until World War I. In 1918, the Prince of Asir, Yahya bin Hasun Al Ayde, grandson of Ibn Ayed, returned to his family throne conquered in Abha with complete independence. In 1920, Asir was conquered by the Ikhwan tribesmen of Nejd loyal to Ibn Saud during the Unification of Saudi Arabia. Abha has many historic places such as forts and other locations, thanks to the region's cultural heritage. Bani Shehr, Bani Amr, Bal-Ahmar, Bal-Asmar, Bal-Qarn, Shumran and some others all belong to "Al-Azd" and some extended families Qahtan, Shahran which is belong to Hood. Azd tribes had migrated after "Marib Dam" collapsed for the third time in the third century AD. Al-Namas, Billasmar Region, Hawra Billasmar Center, Khaled, Eyaa Valley, Athneen Billasmar which is the Capital, Subuh Billahmar, Al-Nimas, Tanomah, Al-Majaredah place, Bal-Qarn Center, and Sabt Alalyaa place (Bishah, Wadi Bin Hashbaal) and some other famous places that belong to the Asir Region. A coastal road connecting Jeddah and Abha was completed in 1979. A SAPTCO bus station connects Abha to other destinations within Saudi Arabia. Abha Regional Airport (Arabic: مَـطَـار أَبْـهَـا‎, translit. Maṭār Abhā, IATA: AHB, ICAO: OEAB) is Abha's main airport. International connections are available to Yemen (Sana'a), Egypt (Cairo), Qatar (Doha) and the UAE (Dubai, Sharjah), as well as to other destinations within Saudi Arabia. Construction of Dutch-designed Abha Airport began in mid-1975, and flights began in 1977. Before construction of the airport, domestic flights were serviced by the military airport near Khamis Mushait by Ali Misfer Ibn Misfer, who was the founder of aviation in Abha in 1945. The city of Abha is composed of four quarters, the largest of which contains a fortress. Hilltop fortresses are a characteristic feature of the city. Shadda Palace, built in 1927, is now a museum displaying local handicrafts and household items. Other notable buildings in Abha include the Abha Great Mosque, the Al-Tahy restaurant, the Abha Palace Hotel, and the funpark next to Lake Sadd. The New Abha five-star hotel is a recent construction on the lake, 1.5 km (0.93 mi) southwest of the town. The head office and the main printing presses of Al Watan, a major Saudi daily, are in Abha. The Saudi government has promoted Abha as a tourist destination. The city hosts events to attract visitors to the city and its surroundings, including the summer Abha Festival, sporting events, shows, exhibitions, and musical performances poets and singers. The artist Talal Maddah died on stage during one such performance in Abha. King Khalid University is a public university in Abha. The University was established in 1999 by merging the Imam Muhammed bin Saud University of Islamic Studies and the King Saud University of the South. Abha is located in the southern region of Asir at an elevation of about 2,270 metres (7,450 feet) above sea level. Abha lies on the western edge of Mount Al-Hijaz, near Jabal Sawda, claimed by some to be the highest peak in Saudi Arabia. Treating the Asir Mountains as part of the Sarawat, the landscape is otherwise dominated by the Sarawat Mountains. The climate of Abha is semi-arid (Köppen: BSh) and it is influenced by city's high elevation. [inaccessible source] The city's weather is generally mild throughout the year, becoming noticeably cooler during the “low-sun” season. Abha seldom sees temperatures rise above 35 °C (95.0 °F) during the course of the year. The city averages 278 millimetres (11 in) of rainfall annually, with the bulk of the precipitation occurring between February and April, with a secondary minor wet season in July and August. The highest recorded temperature was 40 °C (104 °F) on August 25, 1983, while the lowest recorded temperature was −2 °C (28 °F) on December 29, 1983. ^ "Saudi Arabia: largest cities and towns and statistics of their population". World Gazetteer. Archived from the original on 18 February 2012. Retrieved 27 August 2012. ^ a b c d Hoiberg, Dale H., ed. (2010). "Abhā". Encyclopædia Britannica. I: A-ak Bayes (15th ed.). Chicago, Illinois: Encyclopædia Britannica Inc. p. 30. ISBN 978-1-59339-837-8. ^ Walker, Jenny; Butler, Stuart (1 October 2010). 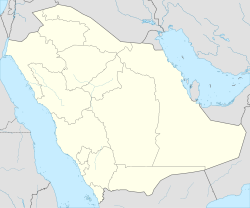 Oman, UAE & Arabian Peninsula. Lonely Planet. p. 336. ISBN 978-1-74179-145-7. Retrieved 27 August 2012. ^ Ham, Anthony; Shams, Martha Brekhus; Madden, Andrew (15 September 2004). Saudi Arabia. Lonely Planet. p. 129. ISBN 978-1-74059-667-1. Retrieved 27 August 2012. ^ Buchele, Nicholas (2009). Saudi Arabia Culture Smart. Kuperard. ^ Robert D. Burrowes (2010). Historical Dictionary of Yemen. Rowman & Littlefield. pp. 5–340. ISBN 0-8108-5528-3. ^ "Climate: Abha - Climate graph, Temperature graph, Climate table". Climate-Data.org. Retrieved 24 August 2013. ^ Mays, Larry (10 April 2009). Integrated Urban Water Management: Arid and Semi-Arid Regions: UNESCO-IHP. CRC Press. p. 46. ISBN 978-0-415-45348-6. Retrieved 27 August 2012. ^ "Abha, Saudi Arabia". Voodoo Skies. Retrieved 24 August 2013. ^ "Climate Data for Saudi Arabia". Jeddah Regional Climate Center. Archived from the original on March 4, 2016. Retrieved October 24, 2015. ^ "Klimatafel von Abha / Saudi-Arabien" (PDF). Baseline climate means (1961-1990) from stations all over the world (in German). Deutscher Wetterdienst. Retrieved January 26, 2016.